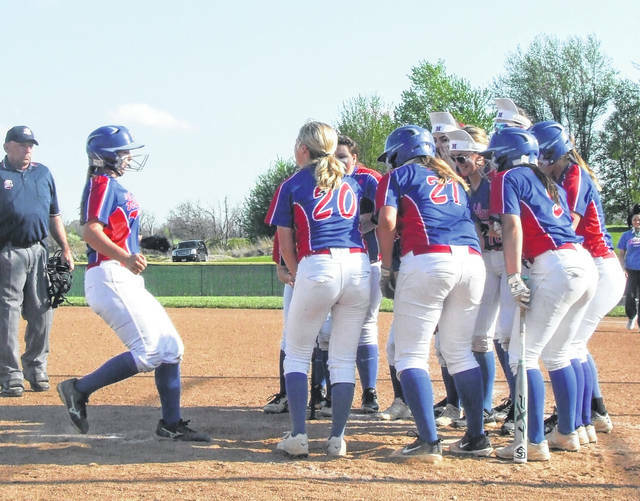 Morgan Wilhelm’s (left) Highland teammates prepare to mob her as she rounds the bases after hitting a three-run home run in the decisive fourth inning of the team’s 10-4 win over River Valley Thursday. Highland’s Lucy Smith pitched the Scots to the win over River Valley in Thursday’s sectional game. One great inning by Highland turned what had been a tooth-and-nail sectional championship contest into a 10-4 win, as the Scots sailed into next week’s district semifinals. Highland scored two runs in the bottom of the first inning, but watched the Vikings tally solo home runs in both the second and third innings to tie the score. However, the Scots responded in a big way in the fourth, tallying eight runs and never looking back in claiming victory. Hornsby noted that in a handful of late-season non-league losses, she didn’t feel the team’s attitude was what it needed to be. Highland’s offense immediately started hitting the ball hard off the Viking pitching, as Savannah Fitzpatrick opened the game with a triple. Both Parker Steck and Liz Jensen then reached base to load them. After the Vikes recorded the first out of the inning, Kaitlyn Carney laced a two-run single to give her team the early lead. Devan Miller would hit a leadoff home run in the second inning and Taylor Hecker added a solo blast in the third to erase that early advantage, but the Scots responded with a huge fourth inning. Haven Farson opened the frame with a single and Lucy Smith followed with a double to put two on. Alli LaFever then smacked a two-run double to give the Scots the lead again. Fitzpatrick would then reach on an error and an intentional walk to Steck loaded the bases. It looked like River Valley would get out of the inning without too much damage done as they were able to induce a pair of grounders they would convert into force outs at home plate. However, Carney struck again with a two-run single and Morgan Wilhelm followed with a three-run home run to turn a 4-2 lead into a whopping 9-2 advantage with two swings of the bat. Highland then got a double by Farson and RBI single from Smith to tack on their 10th run of the game and eighth of the inning before RV could finally get the third out of the inning. 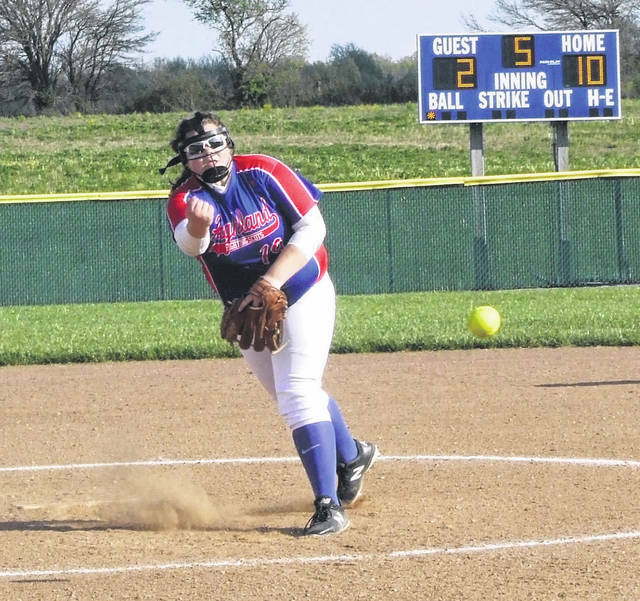 While River Valley was able to manufacture two runs in the fifth frame, Smith was able to shut them down for the rest of the game, stranding five runners over the final three innings to preserve the win. The Scot pitcher finished with three strikeouts, two walks and seven hits surrendered in claiming the win. Meanwhile, Highland picked up 16 hits, with Farson getting three and Jensen, Mattie Ruehrmund, Carney, Smith and LaFever all recording two. Wilhelm had a home run, Farson had two doubles and both Fitzpatrick and LaFever tallied one two-bagger. Hornsby noted that her team has a lot of motivation in the postseason. With a 12-2 record in conference play, they can do no worse than tie for the KMAC crown, which would be their first league title in softball. And their performance against River Valley helped convince the coach that they’ve bounced back from that late-season slump.